Most of these purchases are for Ashlynn's room, since that's what we are focusing on at the moment. However, the first one was a pick up for Kenley's room. Pretty sure her room is now totally complete until she moves into a big girl bed. This Nate Berkus accent table I scoreded at 50% off when Target was rolling out the previous seasons collections and bringing in the new. I always try to wait until markdowns happen and then pounce. For $29, I now have a table for Kenley's room. I had been wanting a table to place next to the chair since we started decorating her room. This matches perfect and is perfect for a stack of bedtime books . I also picked up a nightstand for Ashlynn when Target had a 20% Circo furniture cartwheel offer. I wasn't sure if I wanted to go with a Jenny Lind style, but I really love the look in her room and it fits the space perfect. Not to mention, it was a good $130 less than it's Land of Nod doppelgänger. Continuing my basic suburban mom Target addiction, I also grabbed this bunny night light for the bunny room. It's already a hit. I had ordered this matching lamp shade when I purchased A's bedding, but still needed to get an actual lamp. The table lamp in her room now is teal, so that will stay there. I picked up this simple one because I figured it's footprint on the nightstand would be minimal and the height would hopefully keep other things she might place there from knocking it over. It was also only $19.99. We will see how that goes in reality. 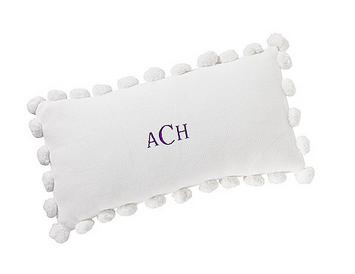 There was also a 20% off any item deal at PBTeen, so I decided to grab this pom pom pillow cover for Ashlynn's bed, since it had free shipping too. Aside from the carpet, we need to hang her curtains and do her closet. We are converting her closet just like we did Kenley's. Removing the doors and putting in new shelving and bars, we already threw out the sticky existing wire shelving. And of course we purchased her bed. Thankfully I was able to cover the cost with all the baby items I sold at the Just Between Friends consignment sale last month, so that was a nice perk since a new mattress, box spring, and bed frame definitely weren't keeping the costs down on the room makeover. Anyone else getting sucked into the Target vortex lately? So cute!! I am totally in the Target vortex, especially with their new nautical line....I would wait, but I think they are going to sell out before anything goes on sale! oh I wish that accent table was still available! That would be perfect in my room!!! 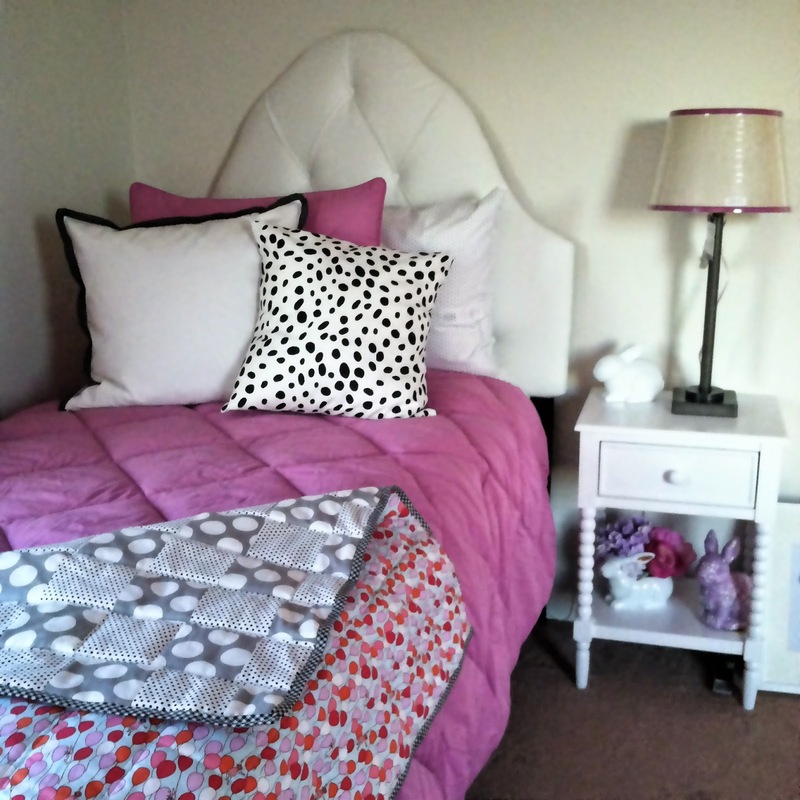 Ashlynn's room looks adorable- love the bunnies! I am always in the Target vortex. When they drop the Lilly Pulitzer line next weekend, it will be worse than ever. I love their new nautical line too! I just wish I had a space to decorate it with so I could justify buying it all. I want that side table in a bad way. I have the worst luck finding the Target markdowns. I only ever seem to like the stuff that is brand new and full price. Meaning I don't buy it. UGH. They usually have a few end caps (on the end of aisle not facing the main aisles) that are designated for mark downs. I make sure to swing by them almost every visit. The Threshold stuff usually seasonal and lasts for maybe 8-10wks before they mark it down and start to bring in a new collection. Usually the items that are still around at the end of the collection period will be around for mark down. Oof... Mental note to stay away!! Call around and find out!! I can see if I can get you the UPC from ours if you need it! UGH ME TOO!!! Except I have space, just not the budget!! Apparently fixing our kitchen and giving our daughter a room prioritizes over decorative crap to my husband. Great buys! Love the pillow!